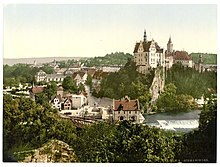 The Nazis had some intention of annexing a large swath of northeastern France and replacing that region's inhabitants with German settlers, and initially forbade French refugees from returning to this region. These restrictions, which were never thoroughly enforced, were basically abandoned following the invasion of the Soviet Union, which had the effect of turning the Nazis' territorial ambitions almost exclusively to the East. German troops guarding the boundary line of the northeastern Zone interdite were withdrawn on the night of 17–18 December 1941 although the line remained in place on paper for the remainder of the occupation. 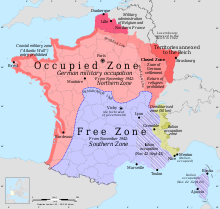 Vichy France was recognised by most Axis and neutral powers, including the US and the USSR. 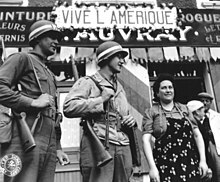 During the war, Vichy France conducted military actions against armed incursions from Axis and Allied belligerents, an example of armed neutrality. The most important such action was the scuttling of the French fleet in Toulon on 27 November 1942, preventing its capture by the Axis. The United States granted Vichy full diplomatic recognition, sending Admiral William D. Leahy to France as American ambassador. President Franklin D. Roosevelt and Secretary of State Cordell Hull hoped to use American influence to encourage those elements in the Vichy government opposed to military collaboration with Germany. The Americans also hoped to encourage Vichy to resist German war demands, such as for air bases in French-mandated Syria or to move war supplies through French territories in North Africa. The essential American position was that France should take no action not explicitly required by the Armistice terms that could adversely affect Allied efforts in the war. On the other hand, technocrats such as Jean Bichelonne and engineers from the Groupe X-Crise used their position to push various state, administrative, and economic reforms. These reforms have been cited as evidence of a continuity of the French administration before and after the war. Many of these civil servants and the reforms they advocated were retained after the war. Just as the necessities of a war economy during the First World War had pushed forward state measures to reorganise the economy of France against the prevailing classical liberal theories – structures retained after the 1919 Treaty of Versailles – reforms adopted during World War II were kept and extended. Along with the 15 March 1944 Charter of the Conseil National de la Résistance (CNR), which gathered all Resistance movements under one unified political body, these reforms were a primary instrument in the establishment of post-war dirigisme, a kind of semi-planned economy which led to France becoming a modern social democracy. An example of such continuities is the creation of the French Foundation for the Study of Human Problems by Alexis Carrel, a renowned physician who also supported eugenics. This institution was renamed as the National Institute of Demographic Studies (INED) after the war and exists to this day. Another example is the creation of the national statistics institute, renamed INSEE after the Liberation. The Third Republic had first opened concentration camps during World War I for the internment of enemy aliens and later used them for other purposes. Camp Gurs, for example, had been set up in southwestern France after the fall of Catalonia, in the first months of 1939, during the Spanish Civil War (1936–1939), to receive the Republican refugees, including Brigadists from all nations, fleeing the Francoists. After Édouard Daladier's government (April 1938 – March 1940) took the decision to outlaw the French Communist Party (PCF) following the signing of the German–Soviet non-aggression pact (the Molotov–Ribbentrop Pact) in August 1939, these camps were also used to intern French communists. Drancy internment camp was founded in 1939 for this use; it later became the central transit camp through which all deportees passed on their way to concentration and extermination camps in the Third Reich and Eastern Europe. When the Phoney War started with France's declaration of war against Germany on 3 September 1939, these camps were used to intern enemy aliens. These included German Jews and anti-fascists, but any German citizen (or other Axis national) could also be interned in Camp Gurs and others. As the Wehrmacht advanced into Northern France, common prisoners evacuated from prisons were also interned in these camps. Camp Gurs received its first contingent of political prisoners in June 1940. It included left-wing activists (communists, anarchists, trade-unionists, anti-militarists) and pacifists, as well as French fascists who supported Italy and Germany. 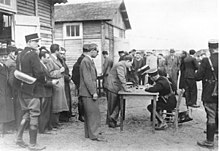 Finally, after Pétain's proclamation of the "French State" and the beginning of the implementation of the "Révolution nationale" (National Revolution), the French administration opened up many concentration camps, to the point that, as historian Maurice Rajsfus writes, "The quick opening of new camps created employment, and the Gendarmerie never ceased to hire during this period." 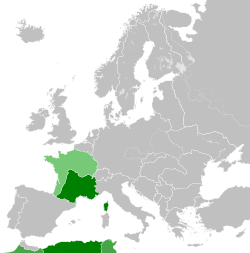 The Vichy government enacted a number of racial laws. In August 1940, laws against antisemitism in the media (the Marchandeau Act) were repealed, while decree n°1775 of 5 September 1943 denaturalised a number of French citizens, in particular Jews from Eastern Europe. 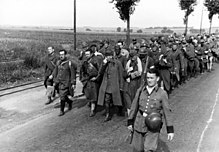 Foreigners were rounded-up in "Foreign Workers' Groups" (groupements de travailleurs étrangers) and as with the colonial troops, used by the Germans as manpower. The Statute on Jews excluded them from the civil administration. With regard to economic contribution to the German economy, it is estimated that France provided 42% of the total foreign aid. In 1941, Nobel Prize winner Alexis Carrel, an early proponent of eugenics and euthanasia, and a member of Jacques Doriot's French Popular Party (PPF), advocated for the creation of the Fondation Française pour l'Étude des Problèmes Humains (French Foundation for the Study of Human Problems), using connections to the Pétain cabinet. Charged with the "study, in all of its aspects, of measures aimed at safeguarding, improving and developing the French population in all of its activities", the Foundation was created by decree of the collaborationist Vichy regime in 1941, and Carrel was appointed as "regent". The Foundation also had for some time as general secretary François Perroux. The Foundation was behind the 16 December 1942 Act mandating the "prenuptial certificate", which required all couples seeking marriage to submit to a biological examination, to ensure the "good health" of the spouses, in particular with regard to sexually transmitted diseases (STDs) and "life hygiene". Carrel's institute also conceived the "scholar booklet" ("livret scolaire"), which could be used to record students' grades in French secondary schools and thus classify and select them according to scholastic performance. Besides these eugenic activities aimed at classifying the population and improving its health, the Foundation also supported an 11 October 1946 law instituting occupational medicine, enacted by the Provisional Government of the French Republic (GPRF) after the Liberation. The conditioning of petty criminals with the whip, or some more scientific procedure, followed by a short stay in hospital, would probably suffice to ensure order. Those who have murdered, robbed while armed with automatic pistol or machine gun, kidnapped children, despoiled the poor of their savings, misled the public in important matters, should be humanely and economically disposed of in small euthanasic institutions supplied with proper gasses. A similar treatment could be advantageously applied to the insane, guilty of criminal acts. Alexis Carrel had also taken an active part to a symposium in Pontigny organised by Jean Coutrot, the "Entretiens de Pontigny". Scholars such as Lucien Bonnafé, Patrick Tort, and Max Lafont have accused Carrel of responsibility for the execution of thousands of mentally ill or impaired patients under Vichy. A Nazi ordinance dated 21 September 1940 forced Jews of the "occupied zone" to declare themselves as such at a police station or sub-prefectures (sous-préfectures). Under the responsibility of André Tulard, head of the Service on Foreign Persons and Jewish Questions at the Prefecture of Police of Paris, a filing system registering Jewish people was created. Tulard had previously created such a filing system under the Third Republic, registering members of the Communist Party (PCF). In the department of the Seine, encompassing Paris and its immediate suburbs, nearly 150,000 persons, unaware of the upcoming danger and assisted by the police, presented themselves at police stations in accordance with the military order. The registered information was then centralised by the French police, who constructed, under the direction of inspector Tulard, a central filing system. According to the Dannecker report, "this filing system is subdivided into files alphabetically classed, Jewish with French nationality and foreign Jewish having files of different colours, and the files were also classed, according to profession, nationality and street [of residency]". These files were then handed over to Theodor Dannecker, head of the Gestapo in France, under the orders of Adolf Eichmann, head of the RSHA IV-D. They were used by the Gestapo on various raids, among them the August 1941 raid in the 11th arrondissement of Paris, which resulted in 3,200 foreign and 1,000 French Jews being interned in various camps, including Drancy. On 3 October 1940, the Vichy government voluntarily promulgated the first Statute on Jews, which created a special underclass of French Jewish citizens, and enforced, for the first time in France, racial segregation. The October 1940 Statute excluded Jews from the administration, the armed forces, entertainment, arts, media, and certain professions, such as teaching, law, and medicine. A Commissariat-General for Jewish Affairs (CGQJ, Commissariat Général aux Questions Juives) was created on 29 March 1941. It was directed by Xavier Vallat until May 1942 and then by Darquier de Pellepoix until February 1944. Mirroring the Reich Association of Jews, the Union Générale des Israélites de France was founded. The police oversaw the confiscation of telephones and radios from Jewish homes and enforced a curfew on Jews starting in February 1942. 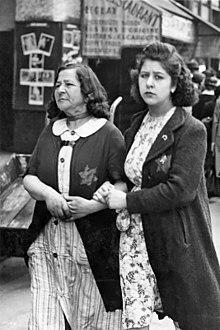 They also enforced requirements that Jews not appear in public places and ride only on the last car of the Parisian metro. In July 1942, under German orders, the French police organised the Vel' d'Hiv Roundup (Rafle du Vel' d'Hiv) under orders by René Bousquet and his second in Paris, Jean Leguay, with co-operation from authorities of the SNCF, the state railway company. The police arrested 13,152 Jews, including 4,051 children—which the Gestapo had not asked for—and 5,082 women, on 16 and 17 July and imprisoned them in the Winter Velodrome in unhygienic conditions. They were led to Drancy internment camp (run by Nazi Alois Brunner and French constabulary police) and crammed into box cars and shipped by rail to Auschwitz. Most of the victims died en route due to lack of food or water. The remaining survivors were sent to the gas chambers. This action alone represented more than a quarter of the 42,000 French Jews sent to concentration camps in 1942, of whom only 811 would return after the end of the war. Although the Nazi VT (Verfügungstruppe) had directed the action, French police authorities vigorously participated. 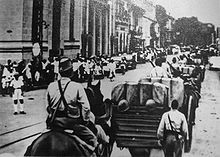 "There was no effective police resistance until the end of Spring of 1944", wrote historians Jean-Luc Einaudi and Maurice Rajsfus. The French police, headed by Bousquet, arrested 7,000 Jews in the southern zone in August 1942. 2,500 of them transited through the Camp des Milles near Aix-en-Provence before joining Drancy. Then, on 22, 23, and 24 January 1943, assisted by Bousquet's police force, the Germans organised a raid in Marseilles. During the Battle of Marseilles, the French police checked the identity documents of 40,000 people, and the operation succeeded in sending 2,000 Marseillese people in the death trains, leading to the extermination camps. The operation also encompassed the expulsion of an entire neighbourhood (30,000 persons) in the Old Port before its destruction. 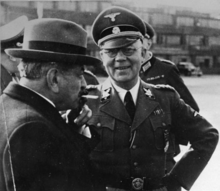 For this occasion, SS-Gruppenführer Karl Oberg, in charge of the German Police in France, made the trip from Paris and transmitted to Bousquet orders directly received from Heinrich Himmler. It is another notable case of the French police's willful collaboration with the Nazis. In 1940, approximately 350,000 Jews lived in metropolitan France, less than half of them with French citizenship (the others being foreign, mostly exiles from Germany during the 1930s). About 200,000 of them, and the large majority of foreign Jews, resided in Paris and its outskirts. Among the 150,000 French Jews, about 30,000, generally native from Central Europe, had been naturalised French during the 1930s. Of the total, approximately 25,000 French Jews and 50,000 foreign Jews were deported. According to historian Robert Paxton, 76,000 Jews were deported and died in concentration and extermination camps. Including the Jews who died in concentration camps in France, this would have made for a total figure of 90,000 Jewish deaths (a quarter of the total Jewish population before the war, by his estimate). Paxton's numbers imply that 14,000 Jews died in French concentration camps. However, the systematic census of Jewish deportees from France (citizens or not) drawn under Serge Klarsfeld concluded that 3,000 had died in French concentration camps and 1,000 more had been shot. Of the approximately 76,000 deported, 2,566 survived. The total thus reported is slightly below 77,500 dead (somewhat less than a quarter of the Jewish population in France in 1940). Proportionally, either number makes for a lower death toll than in some other countries (in the Netherlands, 75% of the Jewish population was murdered). This fact has been used as arguments by supporters of Vichy. However, according to Paxton, the figure would have been greatly lower if the "French state" had not willfully collaborated with Germany, which lacked staff for police activities. During the Vel' d'Hiv Roundup of July 1942, Laval ordered the deportation of children, against explicit German orders. Paxton pointed out that if the total number of victims had not been higher, it was due to the shortage in wagons, the resistance of the civilian population, and deportation in other countries (notably in Italy). 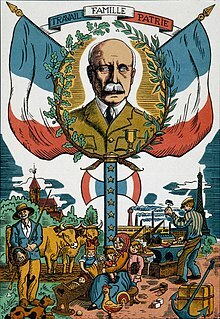 For decades, the French government argued that the French Republic had been dismantled when Philippe Pétain instituted a new French State during the war and that the Republic had been re-established when the war was over. It was not for the Republic, therefore, to apologise for events that happened while it had not existed and that had been carried out by a State it did not recognise. For example, former President François Mitterrand had maintained that the Vichy Government, not France's Republic, was responsible. This position was more recently reiterated by Marine Le Pen, leader of the National Front Party, during the 2017 election campaign. 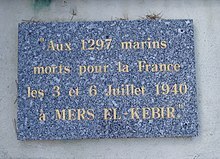 The first official admission that the French State had been complicit in the deportation of 76,000 Jews during WW II was made in 1995 by then President Jacques Chirac, at the site of the Vélodrome d'Hiver, where 13,000 Jews had been rounded up for deportation to death camps in July 1942. "France, on that day [16 July 1942], committed the irreparable. Breaking its word, it handed those who were under its protection over to their executioners," he said. 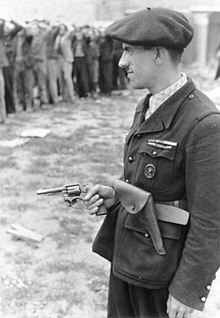 Those responsible for the roundup were "4500 policemen and gendarmes, French, under the authority of their leaders [who] obeyed the demands of the Nazis..... the criminal folly of the occupiers was seconded by the French, by the French state". ^ Dompnier, Nathalie (2001). "Entre La Marseillaise et Maréchal, nous voilà ! quel hymne pour le régime de Vichy ?". In Chimènes, Myriam (ed.). La vie musicale sous Vichy. Histoire du temps présent (in French). Bruxelles: Éditions Complexe – IRPMF-CNRS, coll. p. 71. ISBN 978-2870278642. Playfair, Major-General I. S. O.; et al. (1954). Butler, J. R. M. (ed.). The Mediterranean and Middle East: The Early Successes Against Italy (to May 1941). History of the Second World War, United Kingdom Military Series. I. HMSO. OCLC 494123451. Retrieved 3 September 2015. 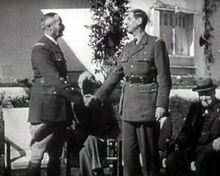 Wikimedia Commons has media related to Vichy government (1940-1944).